One in every 14 people in Jordan is a refugee under the responsibility of the UNHCR. That increases to one in every three with the inclusion of Palestinian refugees under UNRWA.For the fourth straight year, Turkey hosted more refugees – 3.5 million at the end of 2017 – than any other nation. Most of these people were fleeing the conflict in neighbouring Syria. By the end of 2017, persecution, conflict and violence had forced 68.5 million people from their homes. That figure – from the UNHCR’s 2018 Global Trends Report – includes 25.4 million refugees (over half of whom are under the age of 18), 3.1 million asylum-seekers and 40 million internally displaced people. The number of people displaced by conflict and persecution is the highest on record with one in every 110 people worldwide either a refugee, an asylum-seeker or internally displaced. The vast majority of refugees are living in middle- and low-income countries. 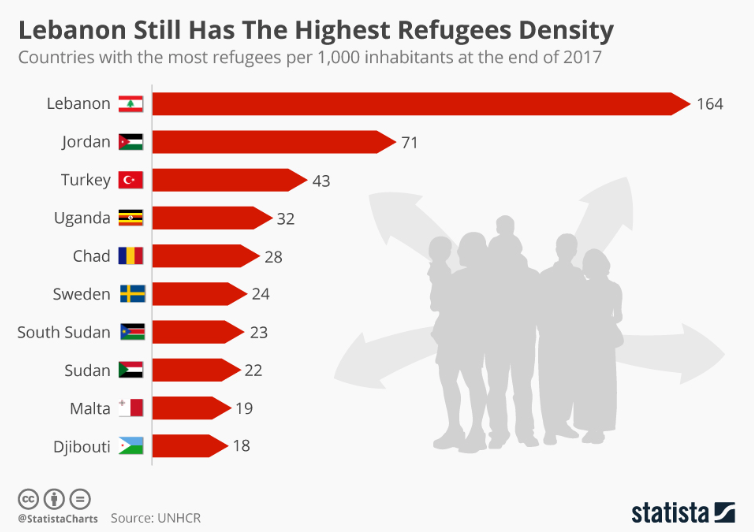 While Turkey has the world’s largest refugee population, Lebanon and Jordan are hosting the highest number relative to population size. In Lebanon there are 164 refugees per 1,000 inhabitants, which equates to one in six people. However, this figure excludes Palestinian refugees under the mandate of UNRWA, many of whom have lived in Lebanon since the 1950s. When this group is included, refugees make up a quarter of Lebanon’s population. One in every 14 people in Jordan is a refugee under the responsibility of the UNHCR. That increases to one in every three with the inclusion of Palestinian refugees under UNRWA. For the fourth straight year, Turkey hosted more refugees – 3.5 million at the end of 2017 – than any other nation. 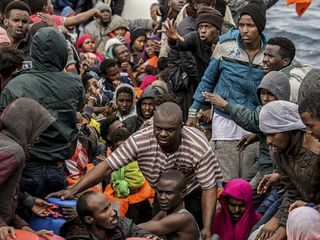 Most of these people were fleeing the conflict in neighbouring Syria. In terms of total numbers in 2017, Pakistan and Uganda were next, hosting 1.4 million refugees each. Since the start of the Syrian conflict in 2011, 6.31 million people have been forced to flee the country. 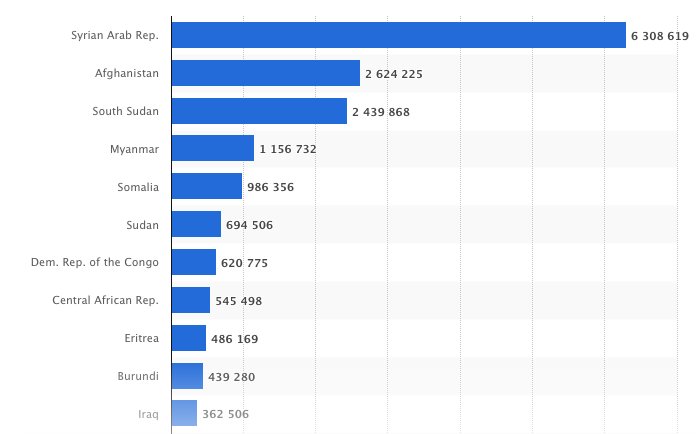 That’s almost one-third of the world’s total refugee population. At the end of 2017, two-thirds – 68% – of all refugees were from just five countries: Syria, Afghanistan, South Sudan, Myanmar and Somalia. UN estimates put the number of newly displaced people in that year at 16.2 million, which equates to around 44,400 people fleeing each day. That total includes 11.8 million people who left home but remained within their own country. Internally displaced people made up more than 80% of the nearly 5 million who returned to their homes or countries in 2017. Despite this, the global rate of forced migration remains at a record high and continues to outpace the returnee rate. Filippo Grandi, UN High Commissioner for Refugees, has called for a coordinated global effort to tackle the problem. “We are at a watershed, where success in managing forced displacement globally requires a new and far more comprehensive approach so that countries and communities aren’t left dealing with this alone,” he said.